1. 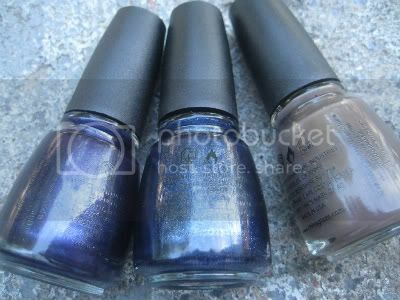 Left to right: Midnight Mission, First Class Ticket and Ingrid all by China Glaze. I picked these up from Sally's. 2. 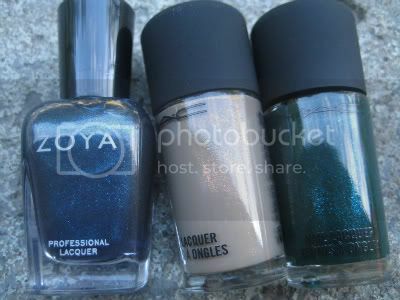 Left to right: Out of This World, Lunar Eclipse and Galaxy Girl all by Orly. Orly's Cosmic FX is the best nail polish collection I've ever seen in a while! I got these from Sally's as well. 3. Left to right: Zoya Kotury (picked this from Trade Secret), Earthly Harmony and Jade Dragon both from MAC's new nail trend collection. Overall, I'm loving this new vibe of small glitters in dark polishes. I have not worn any of these yet but I can see a common trend which I love! I picked up "cooler" toned fall shade this year as my stash is full of warm purple, burgundy and blood red shadeed nail polishes. 1. MAC Rain of Flower (left) vs Orly Out of This World (right). I didn't pick up MAC as even though they are not dupes, I find the MAC shade just pales in comparison. Much more flat looking. 2. MAC Ming Blue (left) vs Orly Lunar Eclipse (right). Again I skipped the MAC shade. 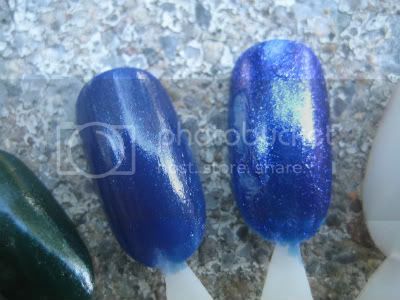 The base of these two is similar but Orly has more reflect glitters in it. You can't see it well in the picture but the orly almost looks like it has a purple flash to it IRL. 3. 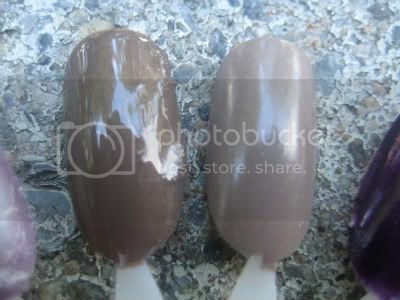 China Glaze Ingrid (left) vs MAC Earthly Harmony (right). These are in the same colour family of mushroom shades that have been popular since last year. They are different enough for me to justify owning both. The fine glitter is more visible in the MAC shade. Did you guys get any new polishes lately? What are some of your favourite nail polish brands/shades? 4 Responses to "Polish Haul - Orly Cosmic FX, MAC Nail Trends 2010, Zoya and China Glaze Vintage Vixen"
You won't be disappointed with Midnight Mission...I was shocked at how pretty it really is in person! I bought the whole Orly Cosmic collection and half of CG Vintage Vixen too. I also got some Zoya for the first time! I'm a little bummed though, i've just learnt that Transdesign has stopped international shipping for Orly. I'm going to miss that brand! I was excited to read this post and learn that they had the Orly Cosmic Collection at Sally's in Ottawa...thought they would be in Toronto already...but they're not! I'm so impatient!